Skin cancer is more common than any other type of cancer that people can get. It is becoming more prevalent with every decade, and is increasing in incidence in all races. Interestingly, it is also one of the most preventable types of cancer, through avoidance of tanning and tanning beds. 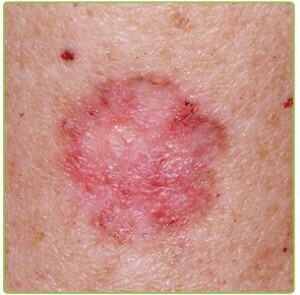 If caught very early, skin cancer is very treatable. The three most common types are listed here. Basal Cell Carcinoma – This is the most common, affecting more than a million people in the United States every year. It is more common in people with fair skin, and in people with a history of longstanding, cumulative, chronic exposure to sunlight, or intermittent intense sun exposure. It can occur even if a person has never had a sunburn. Fortunately, this type of skin cancer almost never gets into lymph nodes, bloodstream or internal organs, and if caught early can be treated with surgery alone. Squamous Cell Carcinoma – This is the second most common type of skin cancer, again seen more often in people with fair skin or a history of chronic sun exposure, either intermittently or daily. Unlike Basal Cell Carcinoma, this type of skin cancer can invade the tissues, getting into the bloodstream or lymph nodes, at which time treatment becomes more complicated. Most often, however, if caught early, this type can be treated easily and with little to no “down time”. 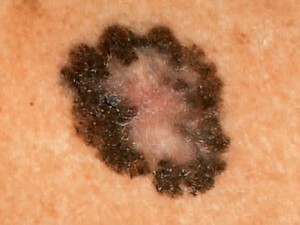 Melanoma– The most serious form of skin cancer, melanoma is also related to sun exposure but also to hereditary factors. This type is much more commonly linked to intermittent sun exposure, such as a history of a blistering sunburn, than to daily exposure. Rates have more than tripled in the past few years due to increased tanning as well as fashions leaving much of the skin exposed to sun. This type can spread to the bloodstream and lymph nodes as well as the internal organs, and when this occurs is very difficult to treat. There is no cure once this cancer has left the skin. As such, it is important to catch it early and treat it with surgery before it has a chance to do so. If you have a new mole, or a changing mole, and you or a loved one are worried about it, please call your dermatologist to have it checked.